We have various example scripts and notebooks for using ipyparallel in our examples directory, or they can be viewed using nbviewer. Some of these are covered in more detail in the examples section. Quickly parallelize algorithms that are embarrassingly parallel using a number of simple approaches. Many simple things can be parallelized interactively in one or two lines of code. Steer traditional MPI applications on a supercomputer from an IPython session on your laptop. Analyze and visualize large datasets (that could be remote and/or distributed) interactively using IPython and tools like matplotlib. Develop, test and debug new parallel algorithms (that may use MPI) interactively. Tie together multiple MPI jobs running on different systems into one giant distributed and parallel system. Start a parallel job on your cluster and then have a remote collaborator connect to it and pull back data into their local IPython session for plotting and analysis. Run a set of tasks on a set of CPUs using dynamic load balancing. At the SciPy 2014 conference in Austin, Min Ragan-Kelley presented a complete 4-hour tutorial on the use of these features, and all the materials for the tutorial are now available online. That tutorial provides an excellent, hands-on oriented complement to the reference documentation presented here. These components live in the ipyparallel package, which can be installed with pip or conda. The IPython engine is an extension of the IPython kernel for Jupyter. 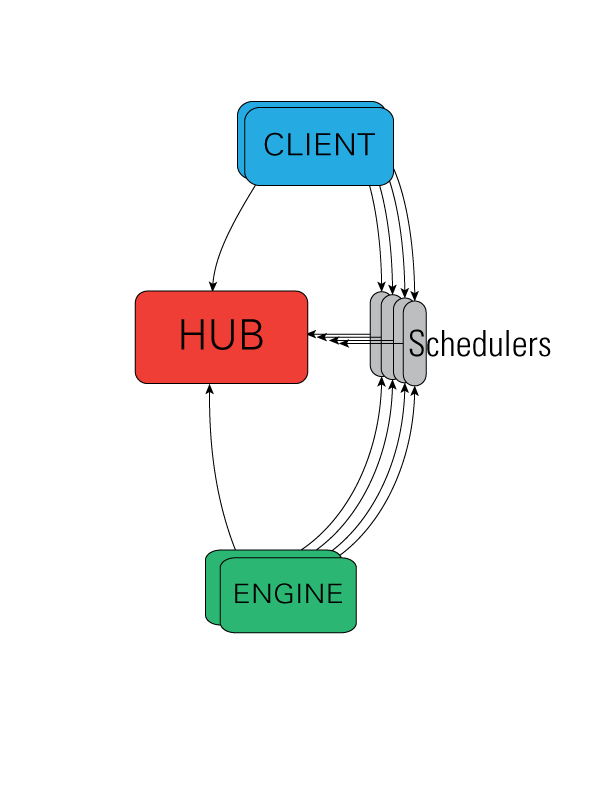 The engine listens for requests over the network, runs code, and returns results. IPython parallel extends the Jupyter messaging protocol to support native Python object serialization and add some additional commands. When multiple engines are started, parallel and distributed computing becomes possible. The IPython controller processes provide an interface for working with a set of engines. At a general level, the controller is a collection of processes to which IPython engines and clients can connect. The controller is composed of a Hub and a collection of Schedulers. These Schedulers are typically run in separate processes on the same machine as the Hub. Advanced users can readily extend the View models to enable other styles of parallelism. A single controller and set of engines can be used with multiple models simultaneously. This opens the door for lots of interesting things. The center of an IPython cluster is the Hub. This is the process that keeps track of engine connections, schedulers, clients, as well as all task requests and results. The primary role of the Hub is to facilitate queries of the cluster state, and minimize the necessary information required to establish the many connections involved in connecting new clients and engines. All actions that can be performed on the engine go through a Scheduler. While the engines themselves block when user code is run, the schedulers hide that from the user to provide a fully asynchronous interface to a set of engines. The DirectView class for explicit addressing. The LoadBalancedView class for destination-agnostic scheduling. IPython uses ZeroMQ for networking, and does not yet support ZeroMQ’s encryption and authentication. By default, no IPython connections are encrypted, but open ports only listen on localhost. The only source of encryption for IPython is via ssh-tunnel. IPython supports both shell ( openssh ) and paramiko based tunnels for connections. There is a key used to authenticate requests, but due to the lack of encryption, it does not provide significant security if loopback traffic is compromised. In our architecture, the controller is the only process that listens on network ports, and is thus the main point of vulnerability. The standard model for secure connections is to designate that the controller listen on localhost, and use ssh-tunnels to connect clients and/or engines. To connect and authenticate to the controller an engine or client needs some information that the controller has stored in a JSON file. The JSON files may need to be copied to a location where the clients and engines can find them. Typically, this is the ~/.ipython/profile_default/security directory on the host where the client/engine is running, which could be on a different filesystemx than the controller. Once the JSON files are copied over, everything should work fine. This JSON file has the information necessary for an engine to connect to a controller. The client’s connection information. This may not differ from the engine’s, but since the controller may listen on different ports for clients and engines, it is stored separately. More details of how these JSON files are used are given below. A detailed description of the security model and its implementation in IPython can be found here. Even at its most secure, the Controller listens on ports on localhost, and every time you make a tunnel, you open a localhost port on the connecting machine that points to the Controller. If localhost on the Controller’s machine, or the machine of any client or engine, is untrusted, then your Controller is insecure. More details about starting the IPython controller and engines can be found here. Where ‘myhub.example.com’ is the url or IP address of the machine on which the Hub process is running (or another machine that has direct access to the Hub’s ports). The SSH server may already be specified in ipcontroller-client.json, if the controller was instructed at its launch time. You are now ready to learn more about the Direct and LoadBalanced interfaces to the controller.